Publicly show earlier in February, the new HEVC/H.265 compression scheme is moving closer towards becoming the next standard in high definition video. A recent study by Philippe Hanhart, Martin Rerabek, Francesca De Simone, and Touradj Ebrahimi not only took HEVC/H.265 through the paces technically but scored it against 30 subjective human viewers. 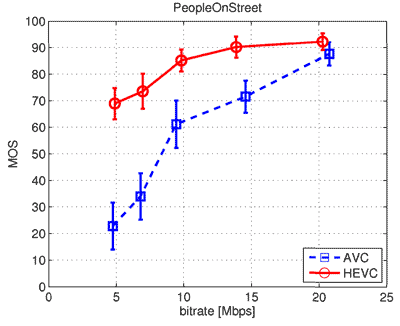 The conclusion: HEVC performs better than AVC/H.264 at half the bitrate in almost all cases. A summary of the report can be found here. For one video, HEVC outperformed H.264 at four-out-of-five bitrates. MOS represents the average quality rating of 30 testers; a higher score is better. HEVC/H.265 works off of larger quantization blocks than AVC/H.264 (64×64 versus 16×16) and splits a single frame into multiple tiles for more efficient multithread decoding. While this is all well and good, it appears the patent holders will be looking towards MPEG LA to handle licensing much like AVC/H.264 which may hinder the switch to the future standard. What does this mean exactly for us as DITs during the production phase? Not much as of yet, as reports point to the extreme slowness of encoding HEVC/H.265 in its current form. In the next year or two, with an optimized or hardware-based encoder, we may see more widespread adoption of web-based dailies for viewing, or the processing of full 4K dailies for viewing.